How’s the fishing? “It’s good and the hunting has been just amazing,” said Rebecca Guerque at Bucks Lake Lodge. “A lot of years I hear of three or four deer but this year on the first day there were nine,” said Guerque. The water has been getting cold, “and I guess that’s when the fish bite,” added Guerque, because apparently they are, biting. “We have four in the sink right now that we caught this morning,” said Guerque. “Another week of exceptional weather and great fishing on Eagle Lake,” said John Crotty on Oct. 28. Mild mornings have led to pleasant afternoons and some spectacular fishing. Rainbow between 2 to 4 pounds are common with an occasional 5-pounder thrown in the mix. Fish are being caught throughout the lake with a variety of methods. Jay Fair flies trolled at 1.5 mph in the top 12 feet of water worked for us with Orange our top producer. Seps grubs trolled on a size 6 hook alongside our flies also produced fish. Water temp hasn’t changed since last week and continues to hover around 56 degrees. Afternoon winds have made for challenging conditions. The general store at the boat ramp will close for the season tomorrow, Nov. 1; no word on how long the boat dock will remain in place. “October and November are prime months to experience Eagle Lake at its best,” said Big Daddy Guide Service’s Ben Williams. Gary Blanchard has been fishing southwest at Pyramid Lake lately. 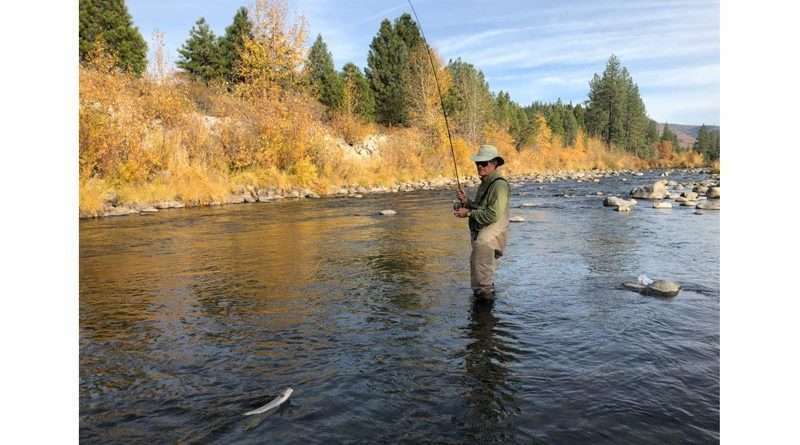 So, if you feel like a beautiful fall drive, he can report that the fishing is great, but no report on Frenchman. John Crotty of Almanor Fishing Association checked in Oct. 28 to update us on conditions at the lake. Water levels continue to drop on Almanor and water temps held steady around 58 degrees. With the full moon and calm days, fishing was tough this past week. “I fished one day and caught some smaller fish, nothing of any size,” said Crotty. Fishermen are mixing up methods, speeds and presentations depending upon conditions. The large schools of pond smelt are tougher to find as are the fish. “I marked lots of bait and fish between Rec #1 and the A-Frame this past week all with lock jaw,” said Crotty. 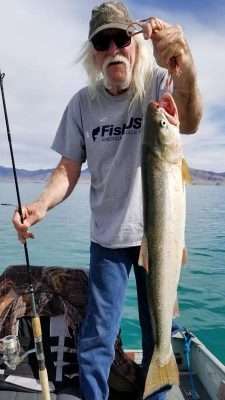 A mix of stockers and larger fish are showing up in the coves around Canyon Dam, fly fishermen and bank fishermen are picking up a few fish. The dock at the USFS Almanor North public boat ramp (near Prattville) has been removed. Canyon Dam is the only public boat ramp with a dock until next season while seasonal businesses and campgrounds are beginning to close. The boat dock in Canyon Dam will remain in the water and the ramp will be open throughout the winter, weather permitting. John Pato from 420incfishing says, “Bass bite has slowed down. But trout bite is good.” Pato is said he is trolling Gold Superduppers at 15 to 20 feet. Fish are being caught along the Middle Fork as evidenced by scenic fall photos from a trip tagging along with fishing guides Zach Silver and Jack Trout (MtShasta.com) the weekend of Oct. 27. It’s coming! The premiere of “Visions of the Lost Sierra” filmed right here on our own wild and scenic Middle Fork of the Feather River by Matt Ritenour. A film by local celebrity Colby Elliot, “A Misty Existence,” will also be shown. Show time is 7 p.m. at the Town Hall Theatre on Wednesday, Nov. 7. Doors open at 6:30 p.m. There will be a total of four films shown to celebrate the 50th anniversary of the Wild and Scenic Rivers Act. Our Feather River was one of the eight original rivers preserved as “wild” in 1968.